Hey everyone, how ya been. 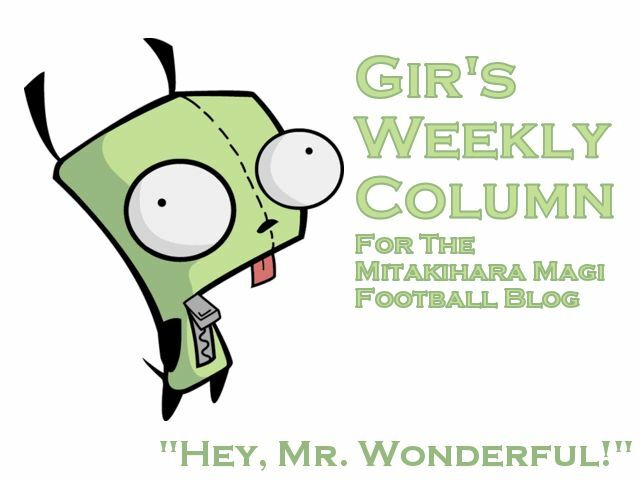 It's your best buddy, Gir Todafunk, back at it with another Weekly Column for the Daily Magi and the Magi Football Blog. In this column, I interview our starting quarterback, Douglas Wayne Daisuke "D.W." Hinoi, and he shares some interesting personal anecdotes. Gir: Tell me a bit about yourself. D.W.: I'm a quarterback from here in Mitakihara Town that started out as a halfback before I converted to my current position. I have a wife, Rina Hinoi, and three baby daughters, Azusa, Asuna and Ayase. They are triplets. I major in engineering. Gir: Your wife is on the Puella Magi volleyball team and she had babies. Did she have to redshirt a season? D.W.: Yeah, she got a medical redshirt due to maternity leave. She's now a redshirt sophomore, meaning she has three years of eligibility left. She is a libero and led the country in service aces last year. Gir: Your nickname is "Ike Ike." How did you get that name? D.W.: "Ike Ike" means "Go Go." I got it when I was a halfback at Mitakihara High School. I was really, really fast, had good speed and acceleration, and I was versatile. I got the team going, so long as I got myself going. That's what I'm called "Ike Ike." Gir: Has switching to quarterback been difficult for you? D.W.: No, not really. The reason why I switched was because Haruyuki Arita, who is now the quarterbacks coach, got injured, and his backup, Reggie Miller, saw his football career end. I was asked by Coach Kaname if I could play quarterback until Haru got back on his feet. Well, I played so well, that I finished second in the Heisman voting. Gir: Are you motivated by getting an opportunity to win a Heisman on your own terms? D.W.: I'm motivated by winning, period. I don't care about the Heisman, to be honest with you, because you can win the Heisman and still not end up as a National Champion. So individual honors do not interest me. I want to defend our Four Corners. Gir: What's your favorite Japanese dish? D.W.: Katsudon. Students in Japan, before taking a big exam, eat a big, piping bowl of katsudon, because it also means, "to win." I like to head to Itadaki Street, a restaurant on the Square, the night before any home game or exam, to eat a bowl of katsudon with brown rice. It allows me to think about the battle that will take place. And when I head to battle, ice water flows through my veins, and I get to work. Gir: Ice water flowing through your veins? You're that composed? D.W.: Every time I head on to the field, I put myself in a zone. Nothing else matters except the game, the roles everyone plays, and my roles. When I put myself in a zone and execute the game plan, then I treat it like I am playing in the NFL. I become a completely different person. Gir: How many years do you expect to play in the NFL? D.W.: In my position, I want to play for at least 10 years then go into work outside of sports. I want to work for a local engineering firm and settle down. Gir: Do you think coaching could be in your future, D.W.? D.W.: Coaching is not my cup of tea. Coaches live paycheck to paycheck, and I would start out as an assistant, and even if I don't do anything wrong, I can be replaced at will. I would rather work in a job that has stability and has good pay. Gir: If you weren't playing football, what sport would you play at Mitakihara? D.W.: Rugby. I hear the Canadian national team needs a new flyhalf. Maybe I can help. And that was interview with D.W. Hinoi, our new starting quarterback for the Mitakihara Magi. Next week, I investigate some of the more interesting restaurants in Victoria, just a drive down the Trans-Can. I am Gir Todafunk, Mr. Wondeful, signing off until then. You are not alone.